This scene is one I've been planning to make and talking about making for years. 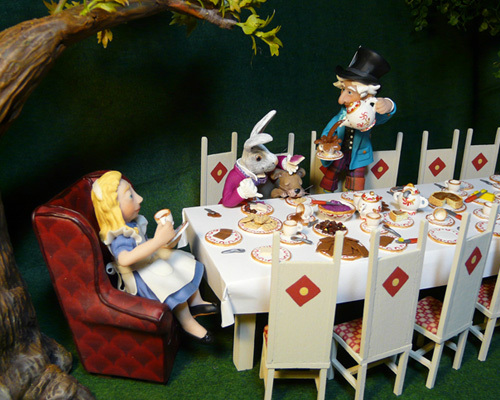 I finally got busy and did it when CDHM (Custom Dolls, Houses & Miniatures) had a "Myths, Fables and Fairy Tales" contest a few years ago and I decided to enter it. So I got busy and made this scene. I started with the teapot! I pictured the tea slopping out over the sides and wanted to get it done while the image was in my mind. Later, I made the Mad Hatter and adjusted his hands to hold everything at the right angles. Kind of tricky, but fun. 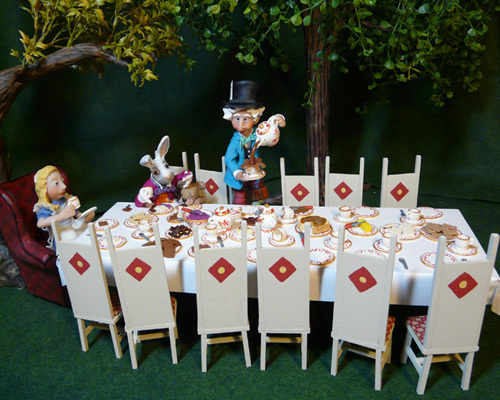 All the characters, their clothing, the dishes and silverware, plus the goodies on the table are all made of clay, using no molds. The table and chairs I made out of balsa and basswood. 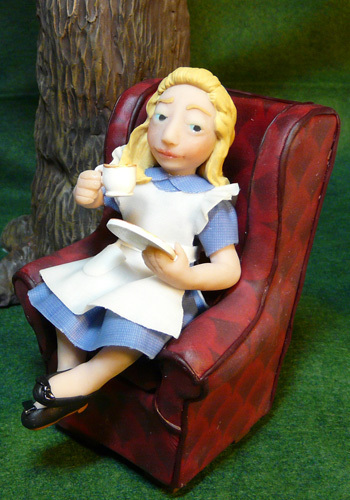 The chair cushions are clay, and the big chair Alice is sitting on is also clay. The scene won first place in the contest!! Not counting the trees (which were actually made to go in the street scene), this setting took over 78 hours to complete. 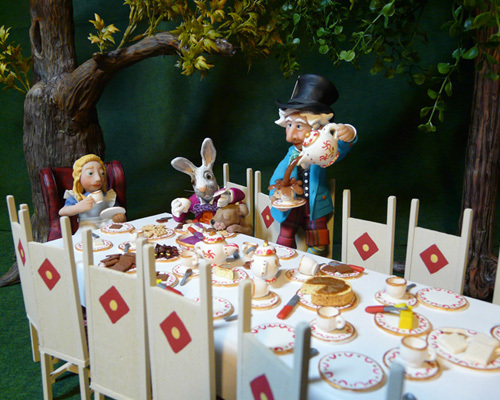 I'm thinking of making a few more Alice in Wonderland scenes, just haven't decided on which ones yet. Or maybe something from Wizard of Oz. This was probably my favorite project of all my miniature and clay work. This table is made of bass wood and the chairs are all made of balsa wood. The tablecloth is actually a piece of plain old white paper. 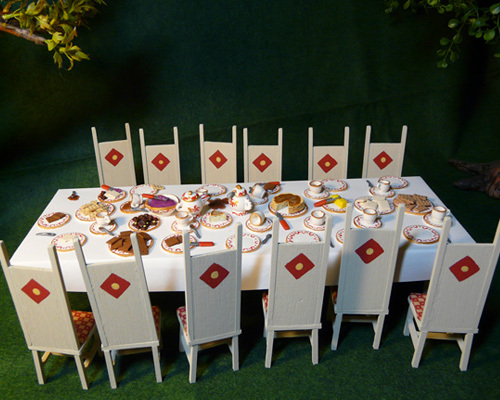 I painted the chairs and the designs on them, and made clay fabric cushions for each. The dinnerware was kind of time consuming to make it all match each other. The design on the dinnerware was painted after it was baked. The food all over the table was the easy part. 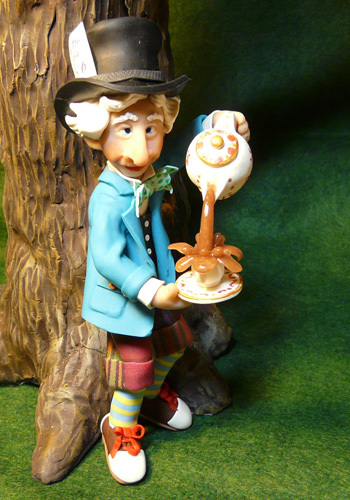 A closeup of the Mad Hatter and his teapot. His clothing was a little time consuming, but I guess that's to be expected when you dress like he does. He stands just about four inches tall, on his toes. Alice looks a little dubious about her situation, and no one can blame her for that. She was the easiest character in the scene, since I'm used to making regular people, not these other characters. And her clothing was rather normal too. Her chair took a while though! It's made of clay, and required several bakings so I didn't mess up finished parts while working on unfinished parts. I wouldn't want to make many of these at all. This fellow is quite a spiffy dresser! 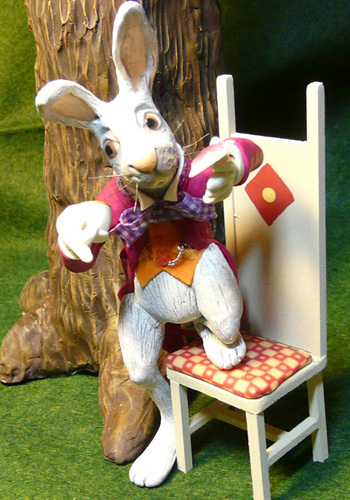 The tricky part making him was getting him to balance on the chair and still be correctly leaning on the sleeping dormouse at the same time. I don't normally paint any figures, but I did drybrush a little grey acrylic paint on his fur to show texture a bit. 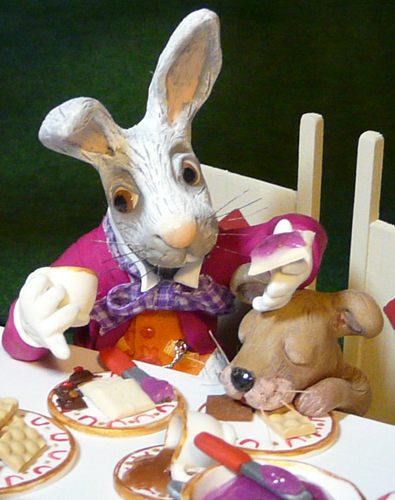 I'm not even sure what a dormouse is, but here he is sleeping with his head in his plate, oblivious to the hare using him for an armrest. His fur is drybrushed a bit too. His little whiskers are hairs pulled from a stiff bristle brush. I did the same for the hare's whiskers. Here's a full view of the whole scene. I had briefly considered selling this whole thing, but didn't, and am glad I didn't. It's really a one-time endeavor, not to be repeated. Not repeated, but I still would like to make other scenes. Have to figure out where to keep them all first. Deep, large shadow boxes, maybe?